This house was built sometime before the turn of the century. The local courthouse with all of the tax records burned down around 1900, so one can only speculate its age. 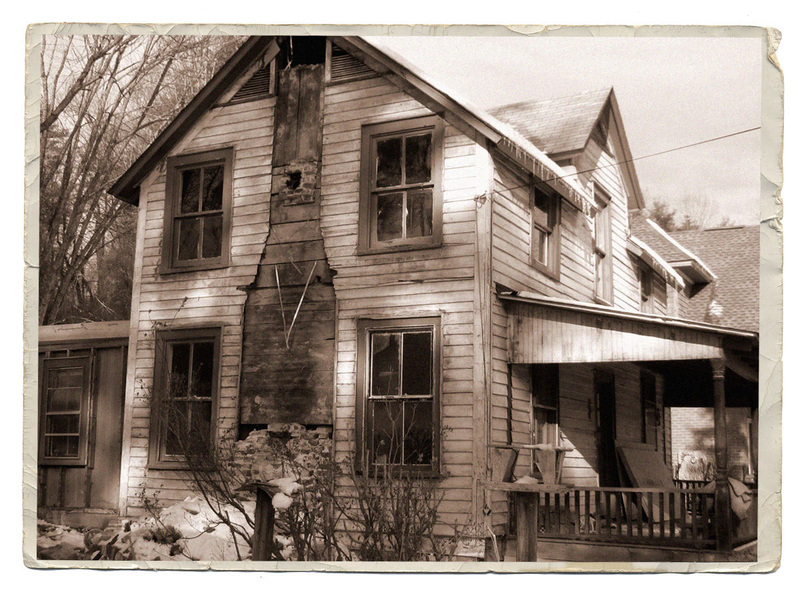 The home was likely a boarding house for travelers passing through on the nearby railroad. The two upstairs rooms had small porcelain corner sinks and the old train depot is only a few hundred yards away. In late 2006 this place was in really rough shape. Many professionals would have simply gone the practical route: tear it down and start over. But Wheelhouse saw this as an opportunity to experiment with building science and preserve some local history. The goal was to make a super energy efficient house and build it with as many locally harvested and reclaimed materials as possible. ERV (energy recovery ventilation system)- provides fresh air, which is controlled with a humidistat that regulates the amount of humidity in the entire house. Over the last couple of decades, evergreen trees and shrubs grew thick surrounding the entire house and causing some major mold issues. After cutting away all of the problematic greenery, the house was much happier with an abundance of natural light. To begin on this project, the house needed to be jacked up roughly 5 inches, back to its original state. This required replacing the entire foundation, which was nearly nonexistent anyhow. Three old chimneys were torn down. The exterior steel siding was covering unsalvageable poplar trim and 5” board on board poplar siding and all had to be removed. Windows, shingle roof and old stamped time shingles underneath… all removed. Adding an upper story addition on top of the existing kitchen required tearing it off to rebuild it. The bones leftover included only four exterior walls, no windows, doors, roof, siding, or floor system. A clean slate and the beginnings of a healthy home full of character!